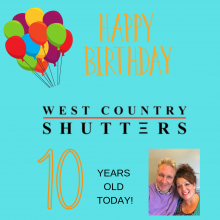 Today we celebrate 10 years of West Country Shutters. Our business, built on our interior design knowledge and passion has gone from strength to strength. Through sheer hard work and determination we have a business that we are incredibly proud of and one that we would have no hesitation of using ourselves. Of course we are a team and our heart felt thanks and appreciation go to our hugely talented and loyal fitters Jon & Steve who always give a 100% on every single job we do. Their skill, passion, knowledge and like minded driving force ensures we are not only a team in name but also in our approach to work making it a fun and easy working relationship. Thank you Jon & Steve for making sure we have reached our ten year birthday and we look forward to celebrating many more years to come.